Comanche of the Month winners from December 2009 through present. 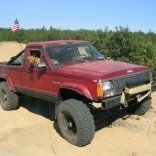 The best Comanche builds in the world are cataloged here. Just what the name implies. V8s, Links, Cages, blowers... Nothing but the good stuff. Common Comanche (MJ) projects with complete write-ups and tons of pictures. Write-ups from all members are welcome. Members post their Comanche (MJ) projects here to document builds over time. Having an issue with the forum? Want to make a suggestion or test out posting images? This is your spot.